It provides comfort and strength to people who are grieving or have suffered a major trauma or shock. I have given this to friends dealing with loss. Used for emotional cleansing, to move a stuck or slow-moving healing process forward. Essential oils that come from trees are grounding, anchoring and give a sense of stability. Helps you deal with life changes/transitions like moving house, getting married, divorced etc. In general, it helps you to go with the flow when life throws you curveballs! Supports respiratory function. Soothes mucous membranes and breaks up phlegm. It is a diuretic (relieves excess fluids and swelling) and supports urinary function which is important for eliminating toxins. Helps regulate blood flow, alleviate menstrual problems, and supports the lymphatic system. A cypress foot bath will soothe tired and swollen feet. It is an astringent (contracts and tightens tissue) and can help tighten skin and clarify large or oily pores and is even helpful for sweaty feet! Helpful for wounds. It is a common ingredient in antiseptic lotions and creams due to the presence of Camphene. When combined with peppermint, helpful in repelling cockroaches. 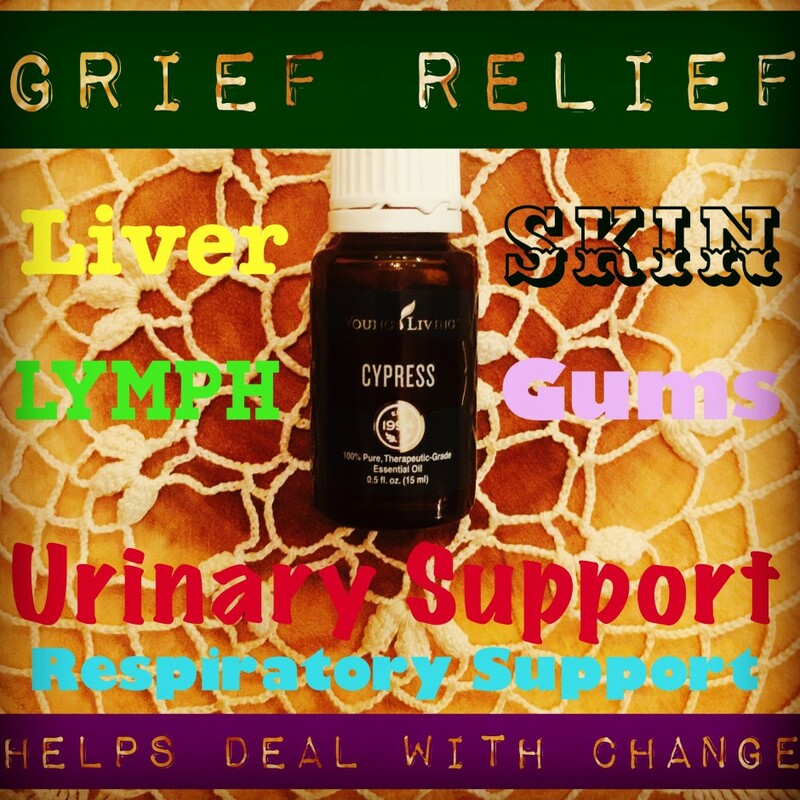 Cypress is a monoterpenes essential oil. Monoterpene compounds have a host of beneficial properties. The primary one being its abilty to reprogram miswritten information in the cellular memory. With improper coding in the DNA, cells malfunction and diseases manifests. Monoterpenes support the body’s natural defense system. Monoterpenes stimulate the pineal gland which enhances spirituality. A good oil for kids. This is an oil I use a lot on Ava. To help deal with grief or overwhelming emotion, massage over your heart. Use aromatically by diffusing in the room or inhaling directly from the palms of your hands. For perfectionism, inhale directly from cupped hands, or use 1 drop daily over the heart or solar plexus. Rub on the chest with a carrier oil for respiratory and breathing support. Rub over the liver for liver support. Add to a footbath for tired feet. Cupressus sempervirens, the botanical name of this plant comes from the Greek word that means “forever living.” (semper = forever and virens = living). Cypress trees are often cited in art and literature, and have long been associated with mortality, grief, and the immortal soul. Legend also has it that the cross on which Jesus was crucified was made from cypress. Cypress trees are planted in graveyards by many cultures all over the world. To quote Roberta Wilson in The Essential Guide to Essential Oils: The Secret to Vibrant Health and Beauty “The evergreen branches of the cypress trees were symbolic of life after death”. The Egyptians dedicated the cypress tree to the gods of death. The Greeks dedicated it to Pluto, the god of the Underworld. In Greek mythology, when Cyparissus, a beloved of Apollo and Zephyrus, accidentally killed his favorite stag, his grief transformed him into a cypress tree . The Greeks used cypress to make statues to the gods. The Chinese revere cypress and associate it with contemplation, as its roots take the form of a seated man when they grow. Cypress also denotes hope, as the cone-shaped tree points upwards and directs our eyes toward the heavens. Cypress wood is noted for its durability and was famously used for the original doors of St Peter’s Basilica at the Vatican in Rome which legend says lasted over 1000 years. Cypress oil has a fresh, slightly woody scent. It is comforting and anchoring scent and a good oil for both women and men alike. Cypress is a needle bearing tree and the essential oil is obtained through steam distillation of young twigs, stems, and needles. Roberta Wilson in The Essential Guide to Essential Oils: The Secret to Vibrant Health and Beauty.